Male Transformation Of The Week - Eyad Yehyawi. Dr. Eyad unknowingly suffered a stroke at the age of 28. At this point he lost all hope with weight going up to 210 pounds. 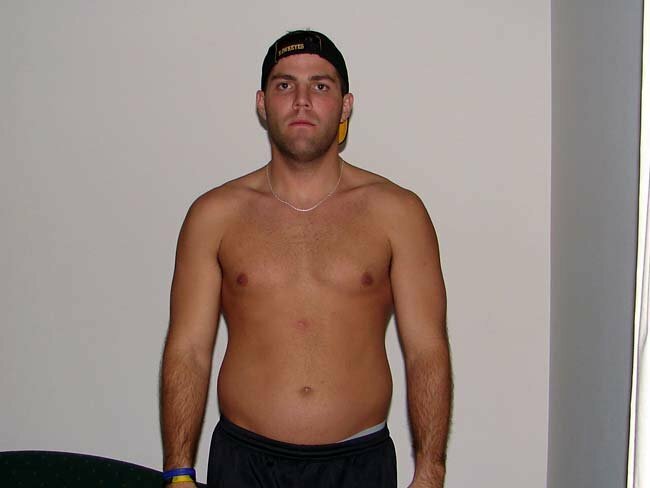 See how he made an amazing recovery and competed after losing 25 pounds and over 10% body fat! In late June of 2005, I was finishing my residency at the St. Louis VA hospital when my life changed forever. After helping a student perform an exam, I stood up but could not feel my right leg. I ignored the problem, thinking that my leg had fallen asleep. However, 30 minutes later the feeling had still not returned. I had trouble walking but still was in denial. Fortunately, a fellow doctor talked me into going to the ER where further testing revealed that at the age of 28, I experienced a stroke. The following days in the hospital were the 4 worst days of my life. They did not know what caused it or what to expect. I tried to stay positive but couldn&apos;t help wondering why this happened to me. I was a 2-sport athlete in college, was constantly on the go and worked out religiously. 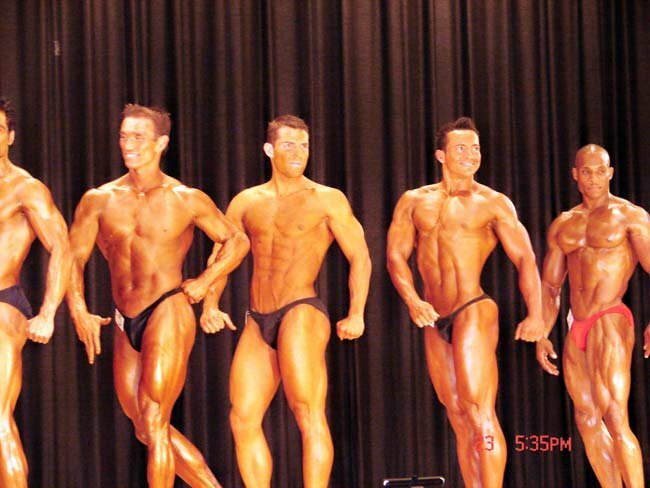 I had become a personal trainer in 1999 and then pursued my dreams of being a doctor. After graduating from optometry school, I pursued advanced training through a pathology residency program for an additional year. So, with one week to go in my residency, and my career just beginning, the unfortunate event took place. The doctors determined that I had a congenital heart defect. Unfortunately, a small clot that in most would have passed, escaped through this defect, and caused the damage. I soon regained the feeling in my leg but the advice I then received from doctors crushed me. They said that due to the small opening in my heart, any heavy lifting could cause another stroke. I was lucky they told me, but the next time the clot could lodge in another area of my brain, causing permanent damage or death. I prided myself on staying in shape and did so even through my years while obtaining my doctorate. It was part of who I was and I took tremendous pride in my health. I felt as if I had done something wrong, although I never used steroids or illegal drugs. I was finally released from the hospital with a much different outlook on life. I finally got the courage two weeks later to go for a jog and broke down in tears. I was so scared it would happen again that I just couldn&apos;t push myself. In the weeks that followed I would casually jog or do push-ups, but just couldn&apos;t bring myself to really "workout." The months passed and I grew more depressed. I could feel my confidence and muscle tone shrinking, while my body fat increased. I tried my best to stay positive, Nevertheless, I gained weight and body fat, eventually getting to 210 pounds and over 16% body fat. It was months later when I talked to a doctor that was a close friend of my cousin, also in the medical field. This physician was a neurologist and explained that the incident that happened could indeed occur again, but that it had been present since birth and I had done many things in my life, without problems. He told me to return to lifting sensibly and asked me, "Are you really living right now by not doing what you love?" He reviewed my MRI and most importantly, we had a long talk. He explained that the stroke occurred but with proper medications and yearly physicals, I could resume working out the way I once had. Just hearing that from him gave me the incentive to start over. There was no holding back, I was going to take advantage of this second chance. My goal was to prove to myself that not only could I be fit again, but that I could achieve a condition far superior to what I ever was before. The first thing I did was buy a journal. It was December 2005, nearly six months after my stroke. I wrote down my goals and set up a program based on what I knew. I studied everything I could on physiology, nutrition and strength training. The basis I used was high intensity cardio 5-6 days per week in the morning before breakfast. I chose to run or walk on an incline, but any form of cardio will do. This would allow my body to tap into my fat stores much easier as my glycogen levels would be at their lowest following a night-time fast. In the evening, I would train one body part per day, 5 days per week. These workouts would consist of high intensity training, with the use of drop sets, supersets, partials, x reps and negatives. If I wanted to cut even more body fat, I would add one more cardio session after lifting to further accelerate fat loss while glycogen levels were low. Are you trying to bust through a plateau or increase the intensity of your workouts? The following video guides will show you the most popular intensity building techniques ever known to man. I always asked myself when I was done, "Was it comfortable?" If the answer was no, then I knew I had succeeded. There is a HUGE difference between bad "injury" type pain and the type that you must have to stimulate muscle hypertrophy. The body WILL NOT change unless the stimulus is unique or great enough to illicit this response. That was the basis of my training. The nutritional aspects of my program were the most important. I truly believe that what we eat is the most important factor to what we look like. Far superior to training. I make sure to eat at least 6-7 small meals per day, with the majority of my carbohydrates at breakfast and post workout, as well as a slow-burning carbohydrate source pre-lift with one scoop of whey. The Secrets Of A Mr. Olympia Breakfast! The right breakfast can mean having lots of energy in the gym, even if you are training in the afternoon. Jumpstart your metabolism with breakfast. I would cut carbohydrates later in the day and usually only eat veggies at night or low glycemic carbohydrates to keep insulin levels in check. Post workout and breakfast were the times I would eat higher glycemic carbohydrates to replace glycogen stores or initiate the repair process. Protein is the key though. To keep my metabolism up and preserve muscle, I would eat at least 1 gram per pound of bodyweight and space it out evenly. I usually ate 250-300g of protein a day, 150-250 grams of carbohydrates and 50-60g of healthy fats. Everyone fears fat, but you absolutely need it to make gains and stay healthy. Once a week I would have a cheat day. This would rev up my metabolism and motivate me for the week ahead. The plan was set into motion and I took it one day at a time. The changes were slow at first but I stayed the course. Staying positive is the key, stick to your program and what you believe in. It is the little things done consistently that are important. 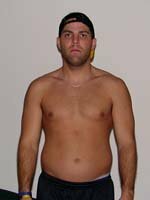 By March 2006, I was down to 195 and 8% body fat. It was at that time that I decided to compete at the Naturalmania Bodybuilding competition in New York City in September. 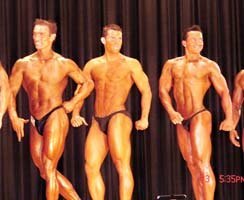 I stayed focused on what I wanted to accomplish and less than one year after my unfortunate event, I was standing on the stage of my first bodybuilding competition. I had gone from 210 pounds and more than 16% body fat to 185 pounds and less than 5% body fat. I never imagined, even before my incident that I would be able to compete at that level. Our greatest limitations are often imposed by ourselves. Please don&apos;t ever do that. Educate yourself, listen to what others say about training and nutrition, ask questions, and form a program that best suits your life. There will always be those bumps in life that can throw us off track. What we must realize is that it isn&apos;t what happens to us in life that matters, but how we handle it. The basis was 1 minute of rest between sets and a lot of supersets. 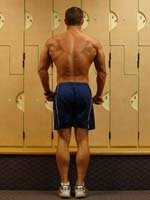 I added partial reps whenever I needed to as well as negatives. I made it a rule to keep a log book and increase the number of reps or weight each weak for each lift sequence. If I failed, I had to switch the routine. This is a basic example of how I trained. All rep ranges were usually 8-12 before reaching positive failure and sometimes I did high/low rep changes to mix it up. "Intense progression" is the key! I add a baked potato to meal 5 and 1 cup rice OR 2 slices wheat at lunch one time per week. This ups my carbohydrates to around 250 grams which is vital to keeping your leptin levels up and your metabolism from slowing down. Leptin is a vital hormone that when very low (because of low carb for too long or starving yourself), will cause you to WANT to binge eat. Increasing carbohydrates 2x/wk will prevent that. There is a cheat day on Sunday in which I eat what I want and relax. Everyone is different, so find what works for you! If I am not getting leaner or adding fat, I will decrease my calories, from carbohydrates, very slowly, until I make progress again. If I am losing to much weight or feeling VERY weak, I will add 40g of low GI carbs (oatmeal/brown rice/wheat bread) to my diet, per meal, and continue to do so, until I feel good again. If I am trying to get extremely lean, I will cut out all fruits/breads and sugary foods (i.e. Gatorade) and replace the fruits with almonds, breads with whole grain oatmeal, and Gatorade with Vitargo (post workout). The key to fat loss remember is stable insulin levels and burning more calories than you consume.